When I think of Extreme Faith Camp, I can’t help but smile. I never thought that I could meet so many youth full of God’s love in one place. I think I can speak on behalf of everyone who went that this week, although seemingly revolving around the middle school campers, touched everyone of all ages. I experienced God’s presence the most vibrantly that I ever have, and it completely changed my outlook on my life. The week before this trip, I’m not going to lie, I started having doubts about it. I was in what I thought to be a super good place with my friends, school had just ended, training for cross country had started, and I was excited for a fun summer with all these seemingly flawless relationships I had with people. However, I knew something was missing and I was confused as to why I wasn’t more excited for this camp that I had eagerly signed up for months before. I’m someone that likes to use a journal as a way to talk to God. Paging through now, I’m realizing that as the school year was ending in May, my journal entries were getting shorter and less frequent. I went to church and talked to God, but He wasn’t really apart of my life outside of the maybe 5-10 groggy minutes of “prayer” as I was lying in bed falling asleep. It was a busy time, and because of that I pushed God to the back burner. I didn’t know why I was having negative feelings about the trip, but I forced myself to be positive about it, and would soon realize that this empty feeling I had about my faith was because I wasn’t putting as much into it as I should. I subconsciously expected my faith to be something that I could just come back to from time to time when I had a moment that I wasn’t putting into something I thought to be more important like homework, running or friends. The moment I stepped out of the car when we arrived at Extreme Faith Camp, I instantly felt a whole lot better. Our car was one of the first ones there, but I could already feel the positive atmosphere. I was not only ready but excited to focus on God and the girls in my small group for a whole week. That night, at night worship with just the leaders, I vowed to leave all the negative feelings at home, and was not only ready but excited to spend this week focused on God and the girls in my small group. It was the first time in months that I didn’t have anything to distract me, and I could be surrounded by people who were on the same walk of faith as me. I was apart of the extreme team, which included being a High School leader to the 6-8th graders both in and out of small groups. I’ve been a small group leader before through programs at OLG, but something about this specific experience was so unique and unexplainable. I met incredible people and formed quick bonds that by the end of the week I seriously did not want to leave. I was a leader for a parish other than OLG, which made me a little nervous at first because I didn’t know anything about the middle school girls I was going lead, but I ended up having a blast. It is crazy to me that at the beginning of the week I had no idea who these girls were, and by the end, we were hugging each other almost in tears wishing there was more time. I remember the first day so clearly because it is when I realized how easy it would be to relate and connect with each one of them. We had just been assigned into small groups, and needed a way to pass the time before the next activity, so we decided to play a game together. We played the “knot game”, where you all stand in a circle, and grab each others hands randomly, and then work as a group to untie the human knot. I instantly felt closer to everyone in my group seeing how well we all worked together, and how open everyone was to each other’s suggestions. It was the perfect sneak peek to what the rest of the week would be like. 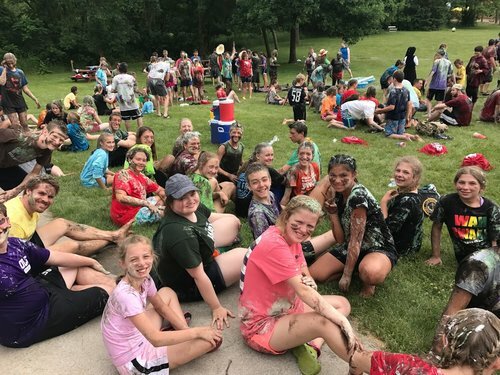 We participated in typical camp activities like 9 square, gaga ball, volleyball, a ropes course and the last big group activity, messy olympics, where we all could let loose and have fun with each other. There was also small group activities and talks, and daily mass. These experiences were plenty enough to make for an incredible week with good people, but adoration and nightly worship were where I really learned a lot about myself. In these moments, I was surrounded by so many people, but I have never felt so alone with God. The energy in the room is truly unexplainable. My favorite line that I remember hearing during the song, Touch the Sky, is “I found my life when I laid it down” and even though everything didn’t make a ton of sense in the moment, I knew that no matter what would happen at home with my life, my friends lives, or the lives of the people I had just met that week, everything was going to be okay. I’m someone who likes to be busy and likes the feeling of working hard, but I learned this week that the things I put my time into are meaningless without God. I was feeling negative about the trip at first because I had let myself lose sight of my relationship with Him in all the business. I was just going through the motions, and the second I stopped and laid it all out before God at camp, I instantly felt a weight lift off my shoulders. I watched God touch the hearts of the girls in my small group and my friends, and I could feel my own heart being filled with His love through everything I did. I realized how much I needed that love. Camp taught me that sometimes, in my busy life, knots are going to form, and the only person who can untangle them is God, who really wants to help me untangle them. Because I chose to go to camp and be on Extreme Team, I will always have that happy and fulfilled feeling I felt in every activity to look back on when I’m in a rut, and my faith isn’t just something I have to make me feel like a better person or because I know it’s the truth. It’s something I know I want. Hey- High School Youth! Join the Extreme Team! Activities such as: kayaking, canoeing, paddle boating, swimming (pool and lake-front), fishing, ropes courses, indoor gym and outdoor courts for basketball, wacky Olympics, arts and grafts, daily Mass, Euchartistic Adoration, and reconciliation. NOTE: registration is currently at capacity and as a result there is a waiting list.